Flag this recipe as your failsafe, easy, buttery base for your Russian Maslenitsa party! Break out your crepe pan! 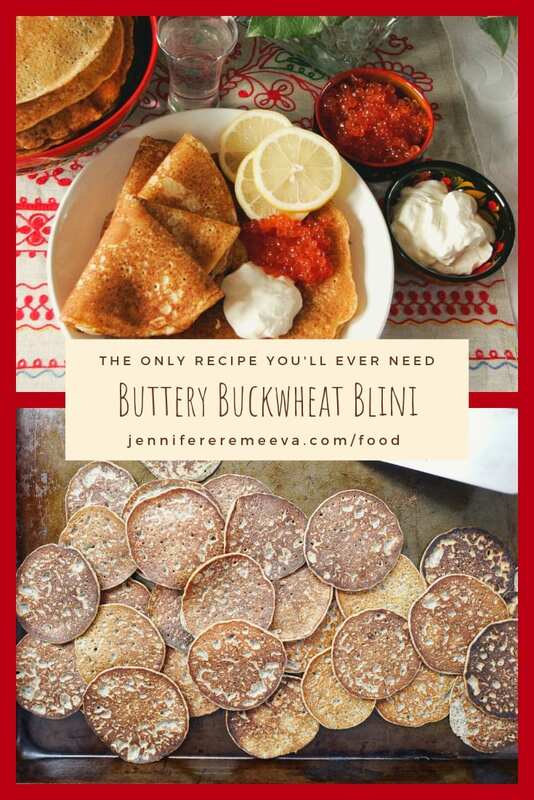 It’s time to make buttery blini! It’s Maslenitsa, Russia’s raucous and riotous Shrovetide! Maslenitsa is the weeklong carnival before Orthodox Lent begins. 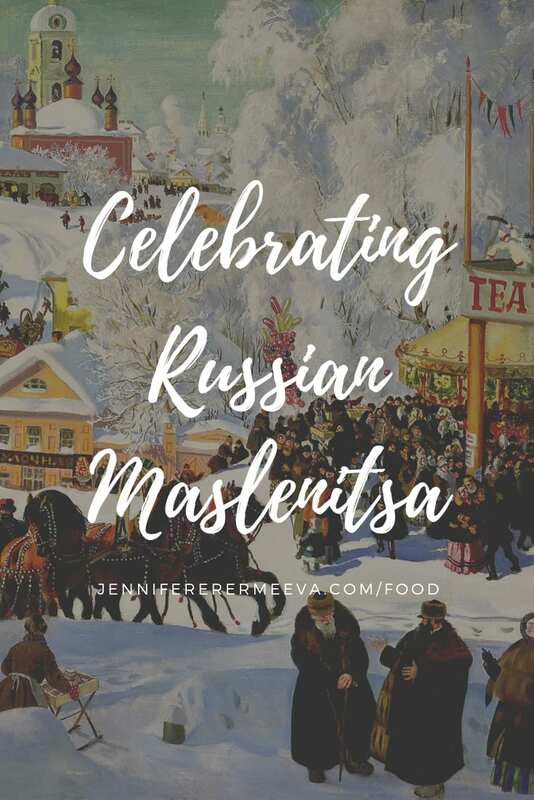 Maslenitsa is a moment when perhaps I catch a hint of that infamously elusive “Great Russian Soul.” This may be because, of all the Russian Orthodox holidays, which took over from their ancient solar calendar precursars, Maslenitsa remains the most unapologetically pagan. Like its equivalent, French Mardi Gras and Anglo-Saxon Shrovetide, Maslenitsa is a ritual banishment of winter and a rapturous welcome to spring. Like all Carnivals, Maslenitsa encourages us to get excess out of our systems before the 40-day rigors of Christian Lent. To coax Yarilo back, the ancient Slavs performed numerous fertility and fecundity rites, and many of these traditions are still integral to the celebration of Maslenitsa. Because Yarilo embodies qualities that are at odds with one another: ferocity, strength, and courage as opposed to beauty, fertility, life, and warmth, many of the rituals involve inverting reality through masquerades, pretend battles, and mummers’ plays. Like the Egyptian god Osiris, Yarilo is locked into an annual life-death-rebirth cycle, and like Osiris, Yarilo yearns for his twin sister and lover Morena, who symbolizes the damp rich earth. Their reunification is the catalyst for the crops to begin to grow. 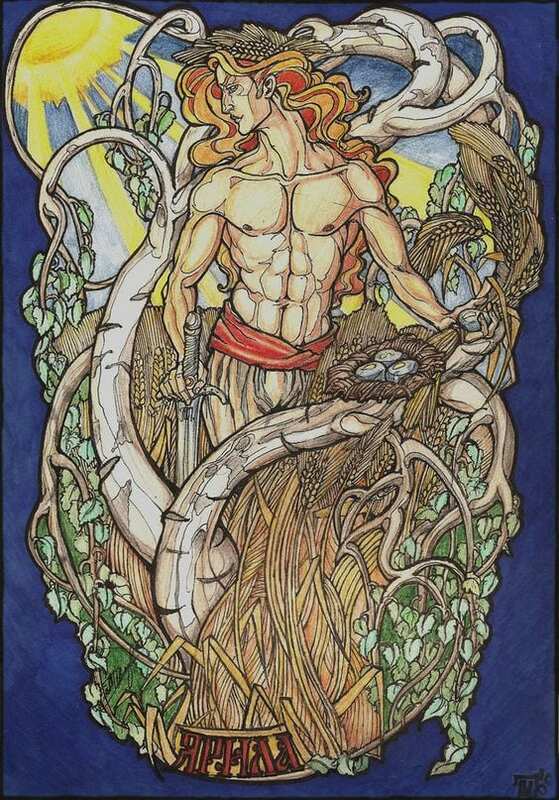 They reach the zenith of their power and intensity of their passion on the summer solstice, celebrated at Ivan Kupala, or St. John’s Night. But when Yarilo departs in the autumn, Morena’s beauty fades, and she becomes a withered crone until the spring returns. This is why the spring equinox was celebrated in Russia as the New Year until as late as 1348. Yarilo is lured from the underworld by massive bonfires, which symbolize the sun. Other round, sun like symbols dominate Maslenitsa: troika rides around the village with torches propitiate the spring sun, as do the signature food of Maslenitsa: pancakes, which are present throughout life and eaten at funerals to symbolize eternal life. For the ancient Slavs, a ritual feast at the beginning of the year with as much rich food as possible represented the most efficacious way of vouchsafing a bountiful harvest. For Orthodox Christians stores, Maslenitsa and Lent offer a handy liturgical excuse for rationing dwindling winter stores before the spring planting can begin. To avoid excessive duds, make your batter ahead of time — this recipe certainly benefits from resting a bit (even overnight) — and then get your skillet(s) going about 20 minutes before your guests are due. By the time they arrive, your house will be redolent with that intoxicating eggy, buttery pancake smell; the duds will be securely hidden in the trash bin, and you’ll have banked a lovely stack of pancakes in the oven. 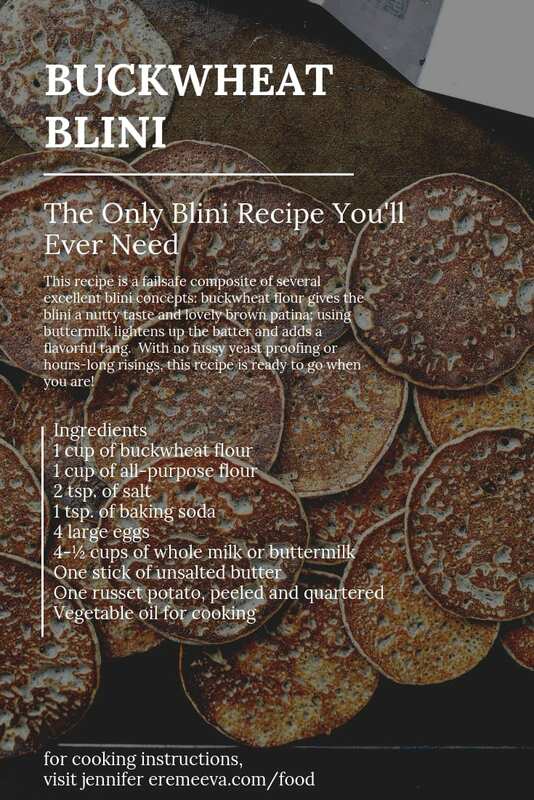 This recipe is a failsafe composite of several excellent blini concepts: buckwheat flour gives the blini a nutty taste and lovely brown patina; using buttermilk lightens up the batter and adds a flavorful tang. With no fussy yeast proofing or hours-long risings, this recipe is ready to go when you are! It makes equally good small blinchiki as well as bigger crepe-type pancakes. The choice is yours! Whisk the eggs and buttermilk together until frothy. Add 4 Tbls (60 grams) of the clarified butter to the mixture and whisk until combined. Combine the remaining clarified butter with 2 Tbls (30 ml) of vegetable oil in a shallow dish. Impale the potato onto a fork, and then dip it into the oil/butter mixture. Use the potato to smear the heated skillet with the butter and oil mixture. The starch from the potato does something — I’m not sure exactly what—but it makes all the difference to how the blini land on the hot skillet. Repeat this before every batch. Pour batter onto the skillet to form a pancake: a tablespoon will produce a nice-sized mini blini, perfect for canapé with toppings, while a ⅓ -cup (75 ml) measuring cup will yield a decent, crepe-sized pancake that is suitable for stuffing and rolling. Clean and dry 1 lb. (500 grams) of fresh mushrooms then cut them into the smallest possible dice. Melt 1 Tbls (15 ml) of butter into a shallow pan over medium heat. Sauté the mushrooms until they leech out their moisture, then reabsorb it again (about 20 minutes). Pour 2 Tbls (30 ml) of sherry or Madeira into the pan and stir until the liquid is absorbed. Spoon in 4 Tbls (60 ml) of crème fraiche. Taste and adjust seasoning with salt and pepper. Melt 2 Tbls (30 ml) of butter in a shallow pan. Add 4 Tbls (60 ml) of finely minced shallots and sauté until limp. Add 4 cups (1 liter) of fresh winter spinach and sauté over medium-low heat until limp. This recipe first appeared in The Moscow Times on February 13, 2018 in an article entitled A Dutiful Daughter-in-law’s Maslenitsa Party.